Available with RED or NATURAL petals | $65. The fragrance oil is absorbed into the reeds and will subtly fragrance any small to medium size room. This reed diffuser fragrance oil is specifically designed to provide maximum scent dispersion – it does not contain alcohol and will last for up to 12 months. 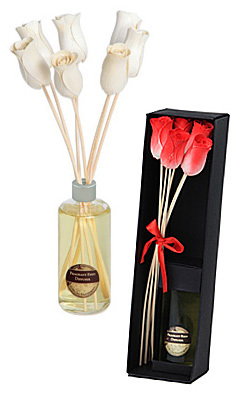 Includes 5 flower reeds and 200ml bottle of fragranced diffuser user oil. PLEASE NOTE: we currently only have black bottles, not clear as shown in the image. A refreshing scent, combining the sophisticated notes of green tea with the clean notes of lemongrass. A combination of grassy notes with a touch of lemon zip. A nice refreshing blend. A wonderful blend of floral lavender and lily, warmed by rich notes of sandalwood and musk.